Dragon Ball Super: Episode 17 "Pan is Born! And Goku Goes on a Training Journey?!" Review – AiPT! I like how in this episode they start with a “PAN IS BORN!! !” episode title, yet when the episode starts, Pan is already there. They skipped right over the actual birth of Pan. Come to think of it, they always skip over the birth of the children in the show. I believe every child in the show was born during a time jump. And there are rarely any pregnant women that are showing in the show either. Even Videl didn’t show in the last episode she was in. But back to the show. Within the first five seconds of the episode we see Pan playing with her grandfather, Mr. Satan. It is here that we are reintroduced to a “character” from Dragon Ball Z. It’s a character where I felt they did a tremendous disservice to Gohan’s development. At one point he was the strongest warrior in the Dragon Ball franchise, even stronger than Goku (when Gohan defeated Cell). Then they decided to pull back on him, make him a “scholar”, and introduce his dressing up as a “super hero” so that he could “fight crime”. His character’s name? “The Great Saiyaman”. Eye roll. Well, The Great Saiyaman and Mr. Satan go to “battle” while Pan is being tossed about between the two of them. Chi-Chi walks in on this and reams them out. Chi-Chi, Mr. Satan, and Gohan get into a verbal argument where Chi-Chi wants her to become a scholar while Gohan and Mr. Satan can see the warrior side of her. We then move onto Bulma, who is driving around when a bunch of bank robbers being chased by police officer Krillin damages her car. Well, Bulma takes matters into her own hands and drives the crooks off the road. Krillin then gives her a ticket for speeding and reckless driving, citing vigilantism. Back to Pan. Chi-Chi had ended up locking up Videl and Pan from everyone else. Gohan and Mr. Satan call in Krillin, Goku, and Bulma to help with the issue. Bulma says she is going to talk with Chi-Chi, who pulls her into the girls group. They finally discuss what Videl would want from Pan’s future, just to find out Videl will let Pan do what Pan wants to do. However, during the conversation, Bulma lets out that Vegeta is training with Whis, to which Goku overhears and bursts through the wall. It turns out that over the last six months, while Vegeta has been training Goku has just been farming. Goku tries to use his Instant Transmission to travel to Beerus’ homeworld, but they must be too far away. Goku proceeds to pester Bulma to see if Whis has arrived. Bulma eventually gives Goku a cell phone so that she can call him when Whis arrives. But this just results in Goku sitting around and staring at the phone. Chi-Chi thinks the phone is for a surprise party for Pan but it piques the curiosity of Gohan. Gohan proceeds to spy on Goku, who oversees Goku getting Bulma’s phone call. Goku goes and confronts Whis about wanting to train. This panicks Gohan, who goes to get Chi-Chi. Whis agrees to train Goku saying “it’s about the right time” … however, Goku must wait till after Whis and Bulma’s lunch plans are finished. Goku then goes on to pester Whis while he is eating. At about the time that Whis is done eating, Chi-Chi shows up and reams out Goku about the training. But in the middle of the argument, Goku sprints off and grabs Whis as he is leaving. As it turns out, despite all that, Chi-Chi is fine after Goku leaves. She knows it’s in his nature to act like this and she knows she can’t change him. She seems perfectly fine with that, but in the end she will still continue to try. We end the episode with Goku heading off to Beerus’ planet and the rest of the gang planning Pan’s now official party. We are still getting the characters in place. Pan is now born, Krillin is a police officer, and Goku is off to train with Whis. I believe next week’s episode we will begin the official movie adaptation. After the episode was finished I felt like punching so many people in the face. Goku was downright obnoxious through the whole thing. Despite his age, Goku has reverted back to a child-like mind. Through Dragon Ball and Dragon Ball Z, Goku had progressed as a character, however in Super I feel they are reverting him back to acting like a spoiled kid who never gets his way. I don’t know why they decided to go backwards with him but it is jarring at times. And this was one of those times. 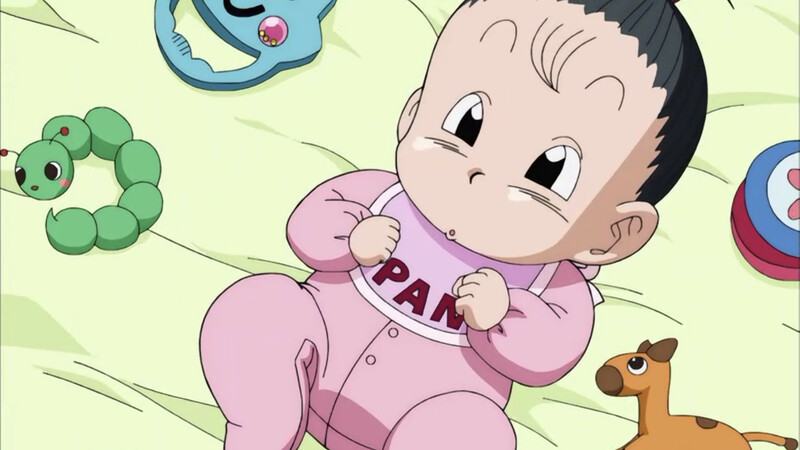 Chi-Chi’s constant nagging had hit a new low this time as well, however the end of the episode attempted to smooth over many of the harsher feelings. In the end both Goku and Chi-Chi know each other best and they both realize that they are going to be whom they are going to be. And it actually kind of redeemed the episode, much to my surprise. Anyway, an entire episode used just to set up Goku training with Whis. I could probably have done without this one as well. So, did you like episode 17 of Dragon Ball Super? Share your thoughts below!